Formed by a synergetic mixture of high performance tools and intelligent features, Banner Engineering’s vision sensors and systems are cost-effective, easy to deploy and capable of being implemented in thousands of applications. Banner’s iVu Series Vision Sensors are the best in class touch-screen image sensor that feature both simplicity & intelligence. The sensors require no computers or external hardware for configuration or monitoring, time & again. Simply installing/connecting iVu sensors can get the system ready for you. The housing is rugged, and built for industrial environments, with a variety of integrated ring lights such as red, blue, green and infrared. If required, the sensors also have an ethernet option for detailed tweaking. Banner’s smart cameras are easy to deploy and offer highly powerful tools for inspection, implementable in a broad variety of applications. Banner’s VE Series Smart Cameras are supported by Vision Manager Software that provides a number of tools of capabilities for configuring them according to specific requirements. Cameras are available in 5MP, 2MP, 1.3MP and WVGA models, all with the same inspection capabilities. They are compatible with various protocols including EtherNet IP, Modbus TCP, Serial RS232, etc. These cameras are ideal for compact applications where flexibility in terms of size is a limit. They possess optical character recognition, optical character verification as well as text string matching capabilities, in addition to the usual 2D & 1D barcode scanning features. Built for industrial environments, the cameras are rated at IP20 and Ip68, depending on the model selected. Area Lights, for creating shadows and avoiding glare or reflective surfaces. Linear Array Lights, for providing illumination of far-off objects. Ring Lights, for illuminating small objects while reducing shadows. Backlights, for ensuring highly uniform brightness to the background. Spot Lights, which provide a single high-power LED beam. Banner’s highly robust iVu BCR offers advanced reading capabilities within a rugged package to meet all your industrial-grade scanning needs. No external PC connection is required for configuration and operation, thanks to the 2.7”/3.5” LCD touch screen display. The barcode is capable of reading a variety of patterns including DataMatrix, Codebar, Linear Bar Codes, Code 39, etc. If required, the barcode reader supports both ethernet & RS232 communications, as well as USB 2.0 connections for easy updating & troubleshooting. 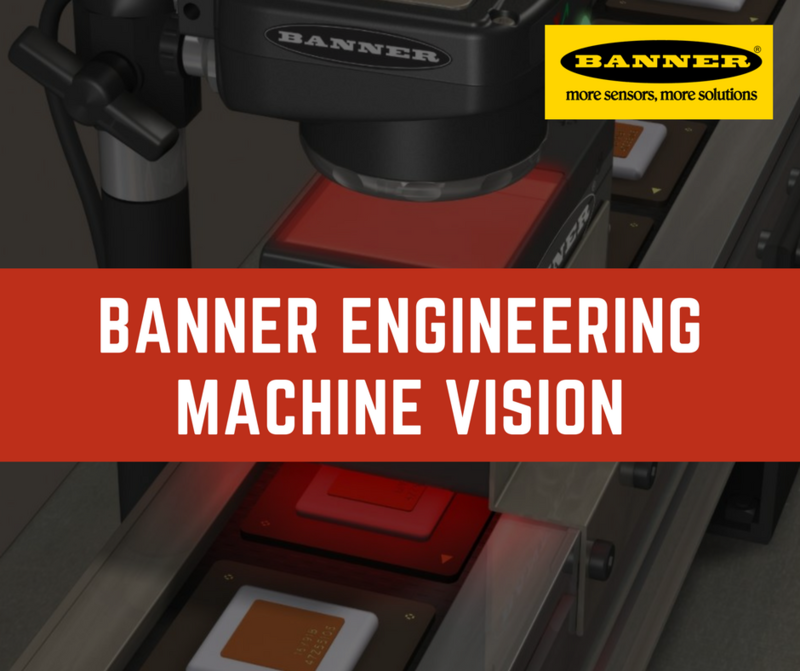 Interested in learning more about Banner Engineering Machine Vision Projects?